And now on travel points -- and various definitions and whether it includes/excludes partisan work. Back from break and now using the "Orientation Guide for New Senators" (exhibit A, tab 13)... still continuing defining what is "Parliamentary Business". Bayne on contracts: Audcent agrees that a company (not just a person) can get a contract from a Senator, and that company can then hire other people to do work to fulfil that contract w/Senator. B: They might be precise people, or if that person doesn't have a certain skill, then people will have to be sourced? A: I would think so, Yes. Bayne says he has about 30 mins left after lunch. Holmes/Crown adds he has 30 mins more. Holmes says he doesn't have any more witnesses today and if Judge will be OK if we break early today when he's finished, around 15:15. Judge OKs, no point in bringing the next witness in for a short period, and ‎adds: "We all know about lawyer sand timing"‎ - laughs. 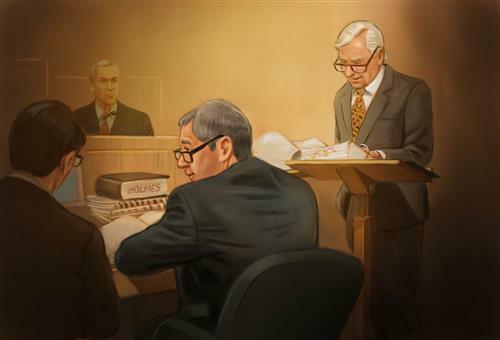 Defence finished with its cross examination, and Holmes is examining Audcent ‎again. H: Defence said upon appointment to Senate, your role has change. He isn't Mike Duffy from Kanata anymore, and is Mike Duffy from PEI. Correct? H: Bieber is 21 years old. So if PM appoints Bieber tomorrow, would he become 30 years old? A: Of course not. Audcent says a Senator can't be appointed unless they are a resident of the province they represent. They can't promise or plan to move there. H asks A if Duffy met the constitutional requirement to sit as senator. Audcent says Senators have to ensure they always meet requirements. H asked if Duffy's residence changed upon Duffy's appointment to the Senate: "The question where you're resident, residence is a question of fact." H: If he's renoing the cottage in 2012 to make it into primary residence, what was it before 2012? A: We're talking about primary residence for financial purposes and not constitutional matters. Depends on what home you make improvements to: you can make improvements *to a* primary residence if it's already a primary residence... or you can make improvements *to make it a* primary residence. Depending on how you frame the question, you have your answer in your question. Court sketch: Day 4 of the Duffy trial. Trial begins with defence raising an issue of untimely disclosure. Says he received new documents – a chapter from Senate Resources Guide – just before the trial began today. Crown be allowed to start examination, but judge says Defence will get appropriate break to allow them to come up-to-speed with new disclosure. Bayne - Wants to raise an issue that’s troubling for me. There’s an issue for untimely disclosure. These charges were laid about a year ago and I’ve prepared for months, and prepared all weekend. After 10 a.m. I was handed a document – part of resource guide (exhibit A tab 7 chap 4) which was the only one ever produced to us. There was none other aspect of the resource guide … perhaps here were document that should have been sourced a long time ago. Bayne – Just been told witness will deal with Part 6 of it, which I’ve never seen. My concern is not only with this document, but behind the scenes there will be more documents. Bayne – I’m certainly going to need some meaningful break, to consider this part of the document but the rest of the document that my client and I will see for the first time today. Neubauer – the document in question is the Senator Resource Guide. It’s one of the document provided to newly appointed senator in the briefing package. … what was in our possession was Chapter 5 relating to budgets, related to the Donohue counts and service contact. Neubauer - What we received this morning was the whole Senator Resource Guide. Witness today is Makhlouf, HR officer for the Senate. The chapter related to some of her work. … the info related to Chapter 4, the HR chapter, overlaps with what was released previously. … it’s essentially clarifying information. Judge – obviously it’s not a novel situation in trials with delayed disclosure. .. when these situation arise, the court has to look at ways to addressing them, and in this particular case, the Crown already conceded, Mr. Bayne will be allowed as much time as appropriate to come up to speed with the disclosure. We’ll commence, and take an appropriate break – ‘hopeful it’s shorter than longer’ – so let’s start by calling the witness. Makhlouf explaining the process of submitting and approving contracts. Makhlouf doesn't validate contractors, that's the Senators sole responsibility. After receiving contract, she is to assess and validate info, look at nature of services (make sure it’s parliamentary work), amount to be paid (she'll only question if amounts seem unreasonable). JN: generally the amount in the budget was between $149k and 169k/year in the 2008-2013 years *** / SM: probably, I can’t confirm. SM: There’s an administrative process to obtain those funds.